Want to spend the night in Langa township in Cape Town in a homely atmosphere? Want to hear interesting stories about South Africa and learn more about Langa and Cape Town township life in general? 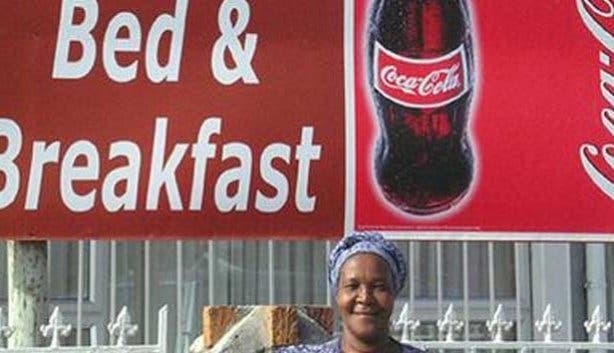 Then Ma Neo's Township Bed & Breakfast in the heart of the Langa Township is a good bet. It has been a good couple of years since Mama Thandi (Neo is her daughter), who works as an Aids counselor, opened her home in Langa township to visitors. "It upset me that the tourists visiting the townships didn't interact with us," she explains over a cup of tea. "They stayed in the bus, afraid to come out. I contacted tour operators and opened my home for lunches and accommodation, so people can actually spend a night in Cape Town's Townships." Ma Neo's Township stay has space for four people and consists of two clean spacious rooms, each with television. Every morning a simple but very tasty continental breakfast is served consisting of several cereals, toast, cheese, jam, yogurt, coffee and tea. But the best thing about Ma Neo's township B&B is that you are welcomed into a family: you share supper and breakfast together, you chat with one another about simple and more complicated issues over tea and when you get to bed you can expect a warm 'good night' from your host. Currently, Mama Thandi is quite successful with her B&B, although it took her about two years before things went her way. "It was only when the minister of tourism and environmental affairs Marthinus van Schalkwyk visited Langa and decided to stay over at my Township B&B when success came my way," Mama Thandi explains while giving us the grand tour of her establishment. "The media contacted me, and wrote stories about me and my B&B, and soon more and more tourists came to sleep in our Township." Mama Thandi welcomes township tourism, and not only because the people spending a night in my township B&B provide her from an income. "Tourism is good for Langa. It creates business, not only for me," she states. "For instance, when tourists buy a snack at a Spaza (township shop), get a drink at a local shebeen (township tavern), or purchase a souvenir at a local crafts stand they contribute to this area of Cape Town. Added to this, tourism enables people like to hire other people and to give them a job. In other words: Township B&B's and Township tourism contributes to the communities of Langa and other townships." Molo says: "More on townships in Cape Town and township tours to Guguletu , Khayelitsha or Langaour Things to do in the Cape Town Townships section or the Things to do in the townships at night." can be found in "I highly recommend sleeping a night in one of the Cape Town township Bed & Breakfasts such as Ma Neo in Langa Township in Langa or Vicky's Towhship B&B and Kopanong Bed & Breakfast in Khayelitsha township."